Everyone likes to receive gifts, no matter it's a Birthday, New Year, or Easter. Particularly pleasing gifts, which you do not wait and have no idea about them. So we decided to tell you about the events where you can get free games licenses or other interesting items. So, let's begin! Nvidia company notes that today, a lot of Free 2 Play game’s requirements and performance not only compete, but also outperform the stationary one. Now when you purchase the GeForce GTX 650/650 Ti or GeForce GTX 660 you get r25 and 50 dollars respectively for World of Tanks, Hawken and PlanetSide 2. Hurry, this offer is limited, and if you have been planning to change the video card it is the perfect time! 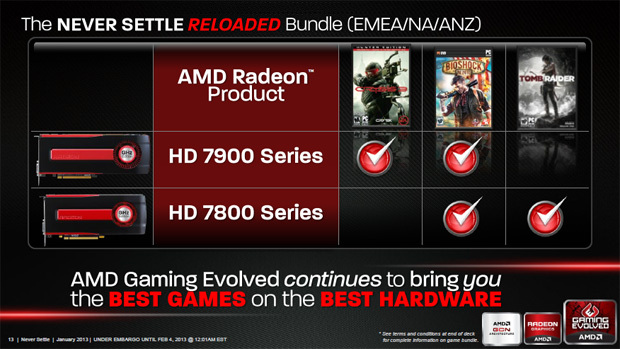 A major GeForce competitors have launched a campaign for Radeon HD 7900 and Radeon HD 7800 for the purchase of which they give the 2013 game license! We will not burden you with technical info and test data of these , just help to get the games! If you buy Radeon HD 7800, you get a BioShock Infinite and Tomb Raider licenses, and if 7900 - Crysis 3 and BioShock Infinite, good, right? The video cards cost is only 170 - 300 $, where 120 $ is the cost of licenses. Finally you get Radeon HD 7900 for 130 $ and 7800 for 50 $!